Did you ever used Windows Phone or are you using it right now? Unfortunately, it was officially announced dead, so you should go to another platform, such as Android. If you’re switching to Android, you will see that only contacts and media files can be transferred from your Windows Phone. What about your messages? If you’re the type of person who keeps his/her messages it would be a pity to lose them forever. There is no official way to import them. Luckily for you, we have a solution: Import SMS from Windows Phone app developed by Leonardocezarÿ. Import SMS from Windows Phone can import SMS, MMS and group messages right into your Android Phone. The app has two versions: a free one and a PRO one, which is paid. All of your messages will be imported exactly as they were on your Windows Phone. The free version can import unlimitedly only SMS messages. It has no Ads and no limit set for import. The PRO version can import unlimitedly also MMS messages and group messages correctly. Also, it automatically corrects invalid backup files (.msg) from Windows Phone. Since Microsoft does not allow developers to access messages programmatically from Windows Phone, we are limited to two apps on Windows Phone which export messages: contacts+message backup and Transfer my Data. If you having a Windows Phone without an SD Card, you can use the only contacts+message backup app to export your messages. If your Windows Phone device has an SD Card, then both contacts+message or Transfer my Data app can be used. Export your messages with one of these apps according to your Windows Phone SD Card support and transfer the backup folder created by the Windows Phone app to your Android Phone via PC or cloud. 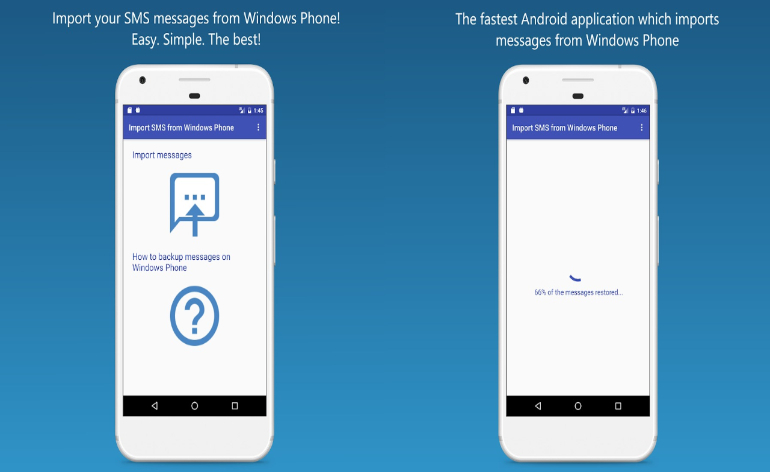 Install Import SMS from Windows Phone app and tap on import messages. You can select from whom you want to import your messages or you can import all of them. If you’re running Android 4.4 or higher, Import SMS from Windows Phone must become the default messaging app, so please allow it. You will be notified of the import’s progress and when the import is finished. Then allow your messaging app to become the default messaging app instead of Import SMS from Windows Phone and that’s it. Your important messages are now on your Android Phone. You can continue to chat and add many more messages to them!